There are so many bloggers I have enjoyed following over the years and over those years it’s been amazing to watch these beautiful ladies grow and evolve into the sassiest little bloggers in the game with such amazing style! But it’s not just bloggers who evolve and find their feet, brands climb the ladder and find their place in the market too and it’s as equally pleasing to see this happen with a brand you’ve loved since day one. MissPap are killing it RN and I’m just in love with so many of their new pieces, you gotta go & check them out! I headed out over the weekend to snap some looks after what felt like forever and by heck was it cold! If you look closely enough, you can actually see myself covered head to toe in goosebumps. It’s safe to say I’m used to the funny looks off people by now – they must think I’m crazy! 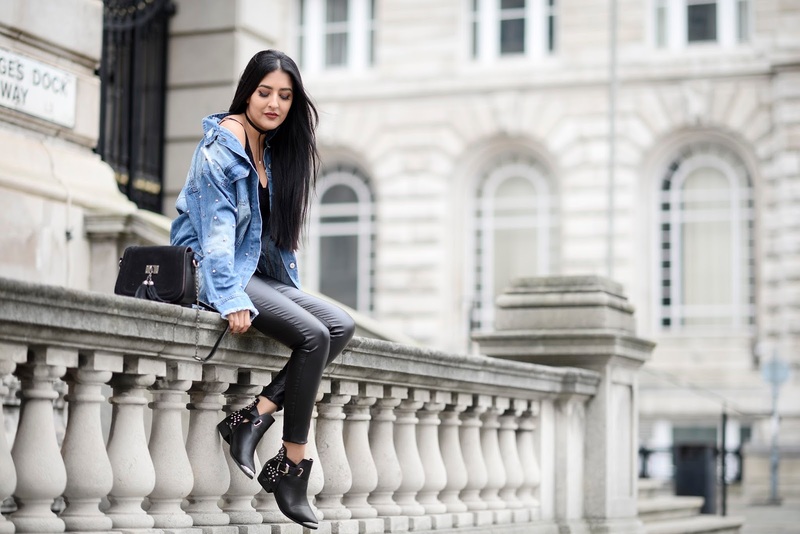 My love of faux leather trousers isn’t going anywhere it seems and this time round I them with this amazing studded denim jacket, lace bodysuit (yep, still love these too) and statement boots. I love to keep things simple and have an item thats the key piece in the outfit and it’s a fail safe way to do this with an all black outfit! I’m also featured in this months BloggerTalk with Misspap! Previous Post Instagram, Ya Dead?